LAS VEGAS – From the time he was old enough to walk, Cort Scheer has been an athlete. In ProRodeo, he’s established himself as one of the best saddle bronc riders in the game. This season, he played the game better than most, earning his first qualification to the Wrangler National Finals Rodeo. Once in the Nevada desert, he has faced tremendous challenges. And he’s still proving his talent rather well, including Wednesday’s 82-point ride on the Bar T Rodeo horse Round Robin, which helped the Elsmere, Neb., cowboy finish in a sixth-place tie for the seventh go-round. With that, he added $1,412 to his NFR earnings, which moved to $23,726. That’s not a bad way to play in ProRodeo’s championship event. Scheer, who competed in a variety of sports as a youngster, competed in college rodeo at Garden City (Kan.) Community College, Montana State University and Oklahoma Panhandle State University. He was a regular qualifier to the College National Finals Rodeo. 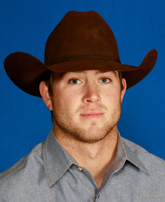 Now he’s playing on the biggest stage in rodeo, earning his spot in Sin City as one of the top 15 saddle bronc riders from the 2010 regular season. In Las Vegas, he has placed in four go-rounds, and his cumulative total of 489.5 points on six rides is sixth best at this stage of the NFR. That plays a role in the race to the NFR title, where the contestant with the best aggregate score will be crowned average champion. And he’s got three more rounds to not only move up in the average standings, but also collect some of the biggest paydays in the game – go-round winners earn a $17,512 check. “It’s dang sure a great opportunity, so we’ll just have to take advantage of it,” Scheer said.